What does Astrology mean to you? The reaction to this question falls within a wide spectrum. Some think of it in a total negative light, as mumbo-jumbo practised by charlatans to mislead the world. Others may see it as a harmless superstition, with maybe some grains of truth but on the whole ignore it. Yet others will get a reading done for arranging a wedding or some big event but otherwise have a benign and easy going attitude towards it. And of course there are those who follow it to the last letter, seeing their astrologer more regularly than their doctor. Where do you stand? My parents were believers. My mother checked ‘rAhu kAlam’ before doing anything of importance (or not of importance). She would read the Tamil astrological magazine Balajothidam end-to-end and would quote knowledgably from it when the occasion arose. My father had a very close relationship with his astrologer. His very favourite religious ceremony was the ‘Navagraha Shanti Homam’ to appease the planets. Where do I stand? Influenced by my parents, I educated myself on astrology when I was still a teenager. I found it interesting but with so many conditions and counter-conditions, I also found it very confusing. How could anybody balance all the different elements and reach exactly the right prediction? I felt that whether there was truth in it or not, there was possibly very little truth in most practitioners. When I was in my thirties, I was cleaning up some paperwork while I was visiting my parents. There I found a 30-year old astrological prediction given to my father. Amazingly, many (but not all) of the predictions had come true..and I don’t mean general predictions, but very particular ones which could not have been just an educated guess. This strengthened my ideas and views. So is it really the planets which determine our destiny? I am not sure. You can give a pen and paper to anyone but will they all write like Shakespeare? Does the talent lie in the pen or Shakespeare’s mind and spirit? I believe that probabilities for the future can be predicted to an extent. 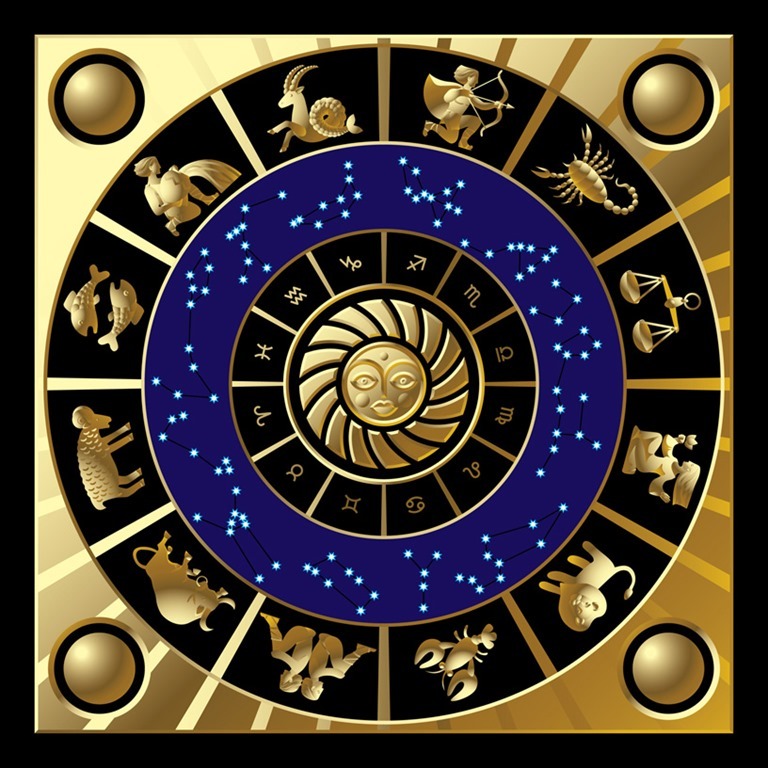 I believe also that an astrological chart can be used as a tool, just as someone’s palm or Tarot cards. However,I think that the glimpse of the future lies not in the chart or the palm but in the mind and spirit of the one who sees. My thoughts today are triggered by the lyrics of Bhaja Re Manasa, a wonderful song in Abheri by Mysore Vasudevachar. The composer urges his -and our- mind to dwell upon Lord Rama, describing his many qualities. Of interest, given my topic today, is his referring to Him as the leader of the Navagrahas. I so love Abheri, it always lulls me into a peaceful state of mind. I had a very happy day yesterday listening non-stop to Abheri! So whom should we listen to today? My first choice is a rendition by the legendary D.K.Pattammal (1919-2009). This is from a live recording in 1977. She is vocally supported by her equally accomplished brother D.K.Jayaraman. DKP’s voice is strong and has such a ‘gambheera bhavam’! The sruthi is so very low, she switches an octave for the low notes..I wonder if she lowered the sruthi so that DKJ could accompany her..
As I was trolling YouTube I listened to this very nice live presentation by Amrutha Venkatesh (in two parts). She is a young lady with a strong voice and a very nice throw, I enjoyed listening to her very much. O Mind (rE mAnasa), revere (bhaja) Lord Rama, the hero (vIram) of the Raghu clan. He is the provider (pradam) of both enjoyment (bhukti) and salvation (mukti). He is Vasudeva. He is Hari. He is far (vidUram) from wickedness (v.rijina). He is the embodiment (AkAram) of the universe (vishva). (Alternate: He is the foundation (AdhAram) of the universe (vishva)). To the virtuous (sujana), he is the Mandara flower (unsure what this implies). He has a beautiful (sundara) form (AkAram). He vanquished (vadha) Ravana and protected (rakshita) the world (bhuvanam). His eyes (nayanam) are like the sun (ravi) and the moon (shashi). He is the God of Love (madanam) of the Sun dynasty (ravi jAti). He is surrounded (pariv.rtam) by the Vanaras such as son of the Sun, Sugriva (ravija) etc (Adi). His throat (kanTHakam) is adorned (parishObhita) by a jewelled (ratna) necklace (hAra). He is the leader (nEtAram) of the Navagrahas – Sun (ravi), Moon (shashi), Mars (kuja), Mercury (budha), Jupiter (guru), Venus (shukra), Saturn (shanaishchara), Rahu and Ketu. He is Rama, the son (kumAram) of a king (rAja), the one dear to (Apta) to Hanuman (pavana) and beloved (manOharam) to Sita (avanijA=daughter of the earth). A very happy Ganesh Chaturthi to all my readers! I hope that you have enjoyed the prasadam (offering) of sweet kozhakattais or modakas which please our elephant faced Lord! On a constant diet, I dare not make sweets. Instead I offer Lord Ganesha sweet music which I hope pleases him even more! The form of Lord Ganesha is beloved to millions from India. There is something so appealing about it, don’t you think? Only sometimes do I let my mind wander to the symbolism behind it. One of the interpretations is shown in the image above, but there may be many more insights which can be derived by the iconography. Perhaps today, this day of celebration of our Lord, we should meditate on what the iconography means to us personally. 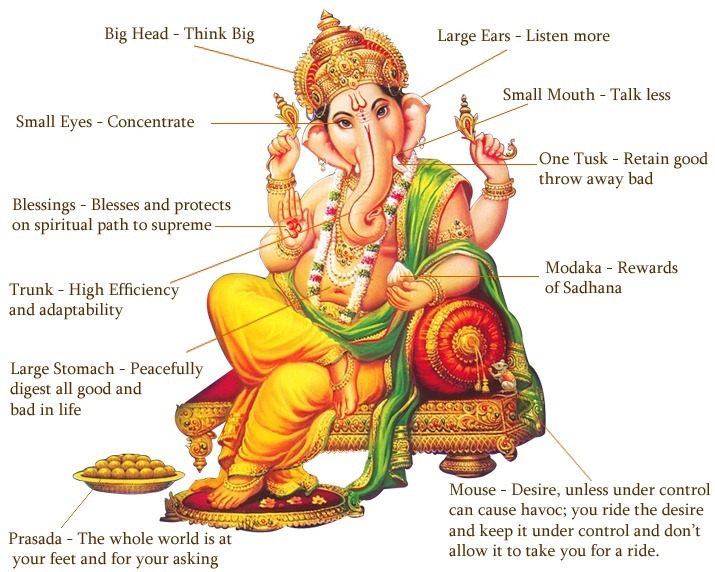 For me, I would like to absorb the lesson of ‘Listen, think, then write’ message from the story of Vyasa’s dictation of the Mahabharata to Lord Ganesha, as represented by His large ears (listen), His large head (think) and the missing tusk (write). To celebrate this day, I offer you a beautiful prayer song in the raga Gowla written by Mysore Vasudevachar. We Carnatic Music fans have our own raga related symbolisms and associations, don’t we? There are some ragas which immediately evoke the presence of certain Gods or Goddesses. Raga Natta, for example, makes me think immediately of Lord Ganesha for it has the same powerful, strident, confident quality that I find in Lord Ganesha. Natta is considered as auspicious to beginnings as He is. Similarly raga Gowla, our raga choice today, has the a steady and rooted quality to it, as well as a certain majesty and grandeur which echoes the qualities of Lord Ganesha. Gowla is particularly impressive in the Mandra Sthayi (the lower octave) and the lower half of the chosen octave (listen to Tyagaraja’s Dudukugala to appreciate this). This gives it a certain weight which reminds me of the heaviness of the form Lord Ganesha and his quality of being a foundation for everything. To know more about this raga, click here. To present this song, I have chosen artists whom I have not so far featured in my blog. For a vocal version, I present V.Shankaranarayan, an artist from Singapore, with a career in banking and still managing to admirably keep up with the demands of Carnatic Music. I do like his voice and energy, but may I humbly point out that pronunciation is important too? पणि is a thief or a miser, फणि is a serpent; these are not interchangeable words! And the word for son is sutam, not sudam. To listen, click here. For an instrumental version, I will go back many decades to Sheik Chinna Moulana (1924-1999), the legendary Nadaswaram player. What a control he has over the instrument! In my mind, this raga suits this instrument very well indeed – an auspicious sounding raga in an auspicious sounding instrument. To listen, click here. 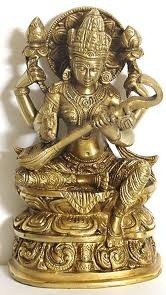 I constantly (satatam) salute (pranamAmyaham) the son (sutam) of Gauri, the devotee (bhaktam) of Vaasudeva who uses a snake (phaNi) as a couch (talpa). Lord (nAtham) of the gang of attendants of Shiva (gaNa), served by a multitude (brnda, assuming it is a form of the word vrnda) immortals (amara), adorned (bhUshitam) by a snake (phaNi) as a garland (hAra), praised (vanditam) by the best (vara) of sages (muni). Holding (dhrta) his beloved (chAru) sweet (mOdakam), elephant (gaja) faced (mukham), destroyer (bhanjitam) of the moon’s (sitakara) endless (amita) arrogance (garva), giver (dAyakam) of happiness (santOsha) to the world (lOka/bhUta) of those who bow to him (nata), protector (pAlakam) of those devotees (bhata) who worship him (shrita), remover of obstacles (vinayakam) so that we may attain fulfilment (siddhi). Today for this ninth day of Navaratri, Navami, and as my 100th post, I have chosen the beautiful composition of Mysore Vasudevachar, Mamavatu Sri Saraswati set in Raga Hindolam to pay homage to Goddess Saraswati. This song is specially meaningful to me. My sister learnt Carnatic Music for many years as a young girl and her lessons and her singing were one of the founding blocks of my love for this music. I cannot listen to this song without remembering her young and lovely voice singing this song while my mother kept talam in my childhood home. In that home, where songs were sung and the listeners enraptured, Saraswati’s presence was all around us. As we worship our Goddess today, we should all remember that She exists not only in temples but in each home where the arts are practiced and loved, be it music, dance or fine arts. She exists in every home in which education is honoured and respected. She lives with us, in us, through us. Oh Saraswati, I salute you. You who fulfil all desires, grant me a boon. I begin my studies today. Let me attain this knowledge successfully. For lyrics of the song and the raga, see footnotes. For an instrumental version, listen to the young musician A.N.Kishan on the Veena. Protect (ava – root av) me (mAm) Shri Saravati ! The One who lives (nivAsinI) in the seat of Kamakoti. Holding (dhRuta) a Veena in your gentle (kOmala) lotus-like (sarOja) hands (kara), beyond (atIta) limits (sImA), bestower (varada) of beauty (vibhUshana) to speech (vAk). Whose feet (charaNa) are worshipped by (pUjita) kings (rAja) and emperors (adhirAja), with lotus-like (rAjiva) eyes (nayana) and a beautiful (ramaNiya) face (vadana). Swift (chatura) to fulfil (pUraNa) the wishes (manOratha) of the virtuous (sujana), whose own (nija) neck (gala) is adorned by (shobhita) a jewelled (maNimaya) necklace (hAra). Extolled (vandita) by Brahma (aja=unborn) and Shiva (bhava), the essence (sAra) of all (sakala) Vedas, ffered (arpita) to your feet (charaNa) by Vasudeva (name of poet-composer). What imbues certain songs with an incredible sweetness which lingers forever in memory? What makes certain compositions much much more than the sum total of their ‘ingredients’ of notes, words and rhythm? I don’t know but Mysore Vasudevachar (1865-1961) sure did when he composed this beautiful song! Vasudevachar belonged to the direct line of Tyagaraja’s disciples and therefore of impeccable musical lineage. His gurus were Veena Padmanabhayya of Mysore and Patnam Subramania Iyer of Tiruvaiyaru. 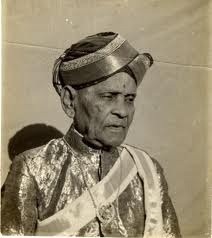 He became the asthana vidwan of the Royal Court of Mysore. Much later in life he joined the faculty of Kalakshetra School of Music and Dance, finally becoming its principal. He composed more than 200 compositions in Telugu and Sanskrit. A list of his compositions is available here. Brochevarevarura is composed in Telugu in Raga Kamas (click here to read more about this raga). Like so many bhaktas before him, and so many after him, the poet begs of Rama ‘O Sita’s husband, don’t you have regard for me? Can’t you listen to my pleas? Aren’t you Vasudeva who rushed to rescue the king of elephants. Dispel my sins, hold my hand and do not let go’. As I listen to this beautiful song, I too pray ‘Rama, I have neither beautiful words nor melody, but I plead the same; Please don’t let go of me’ !! See footnote for lyrics and translation. Today I present an instrumental version of this song by the wonderfully talented Maestro U.Shrinivas (1969) on Mandolin. For a vocal version, listen to this excerpt from a full concert by the Malladi brothers. I like their voice quality very much indeed. I cannot finish this post without mentioning Brochevarevarura sung by S.P.Balasubramaniam and Vani Jayaram for the film Shankarabharanam (1979). Somayajulu as the Maestro emotes very convincingly and Manju Bhargavi shows that neither a stage nor expensive clothes and jewellery are needed to dance as our classics are meant to be danced! As I do not speak Telugu, I have transcribed the song in Devanagari script. The translation is heavily dependent on multiple online sources. O Rama, descendent of Raghu, who will save me other than you? O compassionate one, I cannot leave your lotus-like feet. O Who is worshipped by the four-faced one (Brahma) etc, why are you so aloof sir? I am not competent enough to (assumed sing) your story. Please grant me a remedy quickly. O Lord of Sita, don’ you have affection for me? O the one at whose feet stays (worships) Hanuman, cannot you hear my pleas? Aren’t you Vasudeva who saved the King of elephants? (refers to Gajendra moksha). Cleansing me of all sins, will you not hold my hand firmly?